Paul Vanstone studied at Central St Martins and the Royal College of Art; he is fascinated by the material properties of his medium and has abandoned modelling to work directly as a carver. 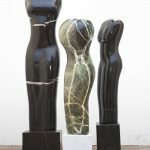 Hunting down the right materials, whether from Spain, Italy or Portugal, is part of his creative process and he loves exploring the physical properties of stones such as lustrous Iranian Onyx and deep green Rajasthan marble. The colour and veining of the pieces are part of the language of the finished form. Other work is executed in Thassos marble associated with the purity of ancient Greek sculpture. In his drapery studies he plays with formal qualities, pattern across a volume, the contrast between the hardness and coldness of the medium and the warm soft cloth. His simplified torso forms have a delicate flow and balance and yet retain the rawness and power of the original block of marble quarried from earth. Vanstone has shown his work at a number of major galleries in London, as well as galleries and sculpture gardens throughout the UK. He has gained many prestigious awards and commissions, among them being the Henry Moore Award, and Lord and Lady Carrington’s Sculpture Garden commission.